Join CBTL on National Coffee Day for their Trade Up Your Cup event. Trade in your Old Coffee Maker for a FREE CBTL Kaldi machine. -8560 Sunset (Equinox Lot – Sunset/Alta Loma). Hourly. -9040 Sunset (directly across from Key Club). Price $7. 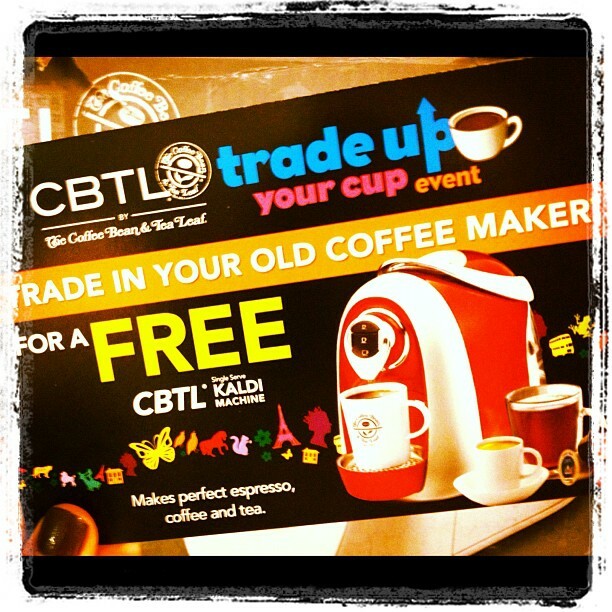 *****First 2500 customers to trade in their old coffee maker will receive a free CBTL Single Serve Kaldi Machine. To be eligible, old coffee maker must have an electrical plug and must be traded in on Saturday, September 29 between 11am and 5pm at the corner of Sunset & Horn. One trade-in per customer only. Cannot be combined with other offers.